Do I have a treat for you today? You get to hear from one of the best runners in the world! 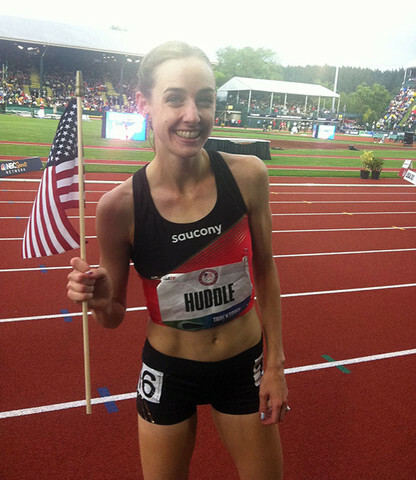 If you are even remotely interested in running, I am sure you have heard of Molly Huddle, and saw how she DOMINATED the road racing scene this fall. She always comes across as a sweetheart in interviews, and today she proves that with her story. I have never actually met Molly, never even been at the same meet, but I have heard so many wonderful things about her, and friends recommended that she would be perfect for an elite takeover, which I definitely agree after talking with her the past few months. Hopefully we will get to meet someday, but it has been nice to take a peak into the story behind of one of the best runners in the world! Thanks for the invite to be a guest on your blog, Tina! I’m often asked how I started running. Many runners, myself included, got into the sport via a parent, sibling or other family member, so I thought a story about ‘the beginning’ was a good place to start! 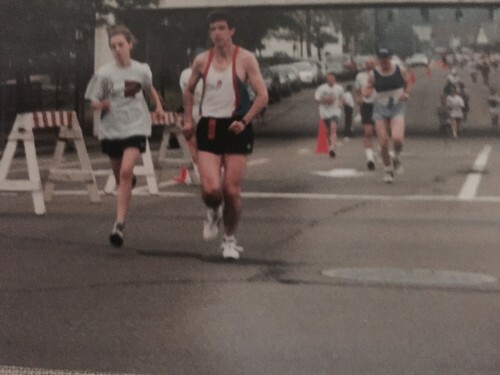 Like a lot of avid runners’ kids, I grew up watching my dad run. At the time he ran many local road races (he was a 49 sec 400m runner in college to a 2:42 marathoner in his early 40’s, so he really switched up events! ), and my hanging out around the finish line pilfering free donuts and bananas amongst all the cool, fit athletes and fun atmosphere made me eager to try the sport. I’m one of four girls, and all of us tried running for some period of time, win lose or draw. I was the only one who eventually gravitated to the distance events, so it became something that my Dad and I shared. I remember the first time I beat my Dad on a run. I was maybe 14 and we were at the intersection of Church St. and Hendy Ave., heading up a hill a mile from home. We were also at the intersection in our running lives where my Dad’s PR’s were slowing down, and I was logging enough miles to prepare for the start of my first high school track season, so we were well­enough­matched training partners. He was not my first running partner, as he was still running too fast, too far and too early in the morning when I started wanting to emulate him in grade school, (though for me at that point, running was still a distant second love to basketball, and in 1995 let’s be honest, probably even behind roller blading). Initially, I would tag along with my Mom for her 2-­3 mile jogs, sprinting ahead of her then having to walk home behind her, much to her annoyance. One day over the summer going into the year of my first real track season as a 7th grader my Dad hopped into the local road 5k with me after he had just finished the 10k about 20 minutes earlier. I guess after that experience he decided I could use a more regular training partner to teach me to pace myself so that I could actually finish more than a mile of running at a time. During this familial bonding time I would sometimes be dragged through 5 mile “long” runs, reticent and out of breath. I remember a wintery morning when I was trudge­running through snow behind my dad on the hilly golf course nearby ( I ALWAYS struggled on cross country runs), stopping to have a brief tantrum behind him, then realizing I still need to get home somehow, so grumpily starting again. Eventually I would feel like we were pushing each other on runs, both working hard as we ran along the final half mile stretch back toward the house. From then on, my times on the track started to drop, and running was worming it’s way to my heart. My dad eventually stopped running with me (though he still ran and raced, and still occasionally does) and started to help coach me through high school track and cross country seasons. I remember when I had missed qualifying for the state track meet my freshman year he bought me some fancy spikes to replace my clunky trainers in which I had actually been racing. He even started a cross country team for me my senior year as our school was too small to offer it. He went through considerable efforts to foster a love of running and competing, two things I always thought were cool, but that he knew took an uncomfortable but worthwhile period of work to truly enjoy doing (like a lot of cool things do). Often fathers use sports as a way to spend time with their kids, and sometimes for a Dad it’s one of the few interests he may have in common with his daughter. I still talk about running with my Dad, and he’s heard it all from the results of High School dual meets to the recap of the Olympic Finals. We talk about his running routine these days, which gets us inevitably talking about other things, and before you know it we have successfully communicated, which is a bonus! Looking back, I can’t tell if my dad was taking it really easy on me at first and just didn’t realize I was pushing to keep up, or if he was subtly trying to train me. Maybe he saw running potential during my early sports events, and felt I needed to be shown the light, rather than crushed by being told I would likely (definitely) never play in the WNBA. The day I turned around and saw that my Dad was a few meters behind me, I was surprised. Did he have a cramp? Had I gotten more fit? I didn’t realize I had been running that hard, and started to slow to wait for him. I’ll never forget him waving me on up the hill, THRILLED at what was transpiring. “No! Go, go!” he said, smiling, nearly fist­pumping, and that’s when I realized that this was what he’d wanted all along. I guess it’s what any parent wants; to push and mold and encourage and guide until, one day, your kid is a little bit better ( or just faster) than you were. Thanks Dad! What would you like to ask Molly? So blown away by what Molly has accomplished. She is a HUGE inspiration and I love knowing that it all started with family and her Dad!! Love this so much. Awww that was such a sweet story! Thank you so much for sharing, Molly. You’re such an ispiration! So cool. I am a runner who has come into running late, but I was a horseback rider with a mom who drove me everywhere and encouraged me all the way. I blew by her early on, but for her, as with your dad, the true joy came when she witness that moment. Molly is SUCH a huge inspiration to me! I love how running started in her family, especially with her dad! I love that you and your dad share a common interest and that he helped get you started! This is a great story, almost made me tear up thinking about you and your dad! I love that my dad got me into running as well- always bringing my sister, brother and I to the track on weekends, always encouraging us to get out there. Thank you for sharing your story Molly! Loved reading this!! My Dad was a huge inspiration for my running and I loved reading about Molly and her Dad. Such a wonderful story and I know he must be SO proud of all you have accomplished. Best of luck in your training and racing Molly – you are amazing!! I love this so much. My dad was a huge reason for my participation in sports growing up. While he was never a runner in the sense of racing and I gravitated towards running later in life (and now just shakes his head at the distance running) he coached us in softball and was my biggest cheerleader in soccer and swimming and everything in between. That time bonding with him, and being frustrated by Dad coaching, still warms my heart to this day. I love the power of sports on building lifetime memories and relationships.